Meera concludes her article on traditional Maharashtrian food with a focus on snacks and sweets, including festival delicacies. Thank you, Meera, for giving us an indepth article on every day, home cooked Maharashtrian food. Sailaja invited me to write about Traditional Maharashtrian Snacks and Sweets. It sure was a very delectable invitation which instantly took me down memory lane. Letâ€™s go to the kitchens of my family & friends and discover some yummy delights together. Pohe is the most common breakfast and it is paired with almost all the vegetables & sprouts like onions, potatoes (batata pohe), tindora/Tondli, eggplant/brinjal, corn, green peas, kala vatana or whimsical creation like soybean pohe. Every vegetable adds a unique flavor to the resulting pohe. I think the most outrageously different pohe would be the one paired with shrimp or prawns (fresh or dry). It is considered a specialty of a certain community in Maharashtra. And I have had a privilege of tasting them at a friend’s place. However the most important pohe is definitely kande pohe. They are synonymous with the wedding arrangements at the bride’s house. “Kaande Pohe program kadhi?” is a loaded question, though it just appears as simple as â€œwhen are you going to have Kande pohe?â€. What it really means is if the groom’s family has come over “to see” the bride yet or not? :-D I think, it has the same association with pre-wedding rituals like â€œSoji & Bajjiâ€ in other parts of â€“ probably South â€“ India. While thick pohe dominate all the above preparation, thin pohes are tempered and served as Dadpe pohe. Tikhtameethacha Saanja is Maharashtrian version of Upma and with turmeric powder, it looks bright yellow. Sometimes Shira (rawa kesari or sooji ka Halwa) is also served for breakfast. 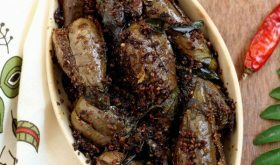 Many homes serve it along with a dollop of spicy pickle just to get a zing while eating cloyingly sweet shira. Leftovers like rice or chapatis are cleverly tempered and made into classics phodnichi poli or phodnicha bhaat. They both taste simply delicious. There are also Maharashtrian versions of dosas like Amboli, Ghavne, Dhirde. An elaborate Maharashtrian meal comprises some crispies like Kothimbeer vadi, Alu vadi, Surlichya Vadya, bhuji. Suralichya Vadya and ALuvadi find their twins as Khandvi and Patra respectively in the neighboring state of Gujarat. Kothimbeer Vadi is a simple cilantro based steamed dumpling which is shallow or deep fried and served. Snacks that are served along with afternoon tea are generally batatavada – which along with paav is almost synonymous with Mumbai and is hailed as Mumbai’s answer to the burger, Misal, Dahi Misal, Thalipeeth. Misal has a mixture of sprouts where as Thalipeeth has a complex mixture of multiple grains and legumes. Thalipeeth Bhajni is generally available in the Maharashtrian pantries to make impromptu Thalipeeth. Served with homemade white butter (LoNi) and tea, it is really a gastronomic delight. Most of the vegetables can be dipped in chickpea batter to make delicious bhujis but most common and beloved are â€œKaanda Bhujiâ€ or onion pakodas which are especially loved during the monsoons. Due to their crooked shapes resembling crabs, they go by a quaint name of â€œKhekda (crabs) Bhujiâ€ though it does not have any crabmeat! Maharashtrian cuisine has excelled in preparing various Upwas/Farali special items like sabudanyachi khichdi, sabudana vada, Shingadyacha Shira, Ratalyacha kees, Batatyache Thalipeeth. Sabudana or Sago pearls, along with peanuts, Rajgira (amaranth grain), Shingada peeth (water chestnut flour), Vari/Bhagar/Moraya/Samo, Potatoes, Sweet potatoes dominate the fasting food snacks category. Grandmothers and mothers (or now shopkeepers!) patiently make the dry snacks for the hungry, homebound kids. These snacks are dry and are kept in the airtight containers. 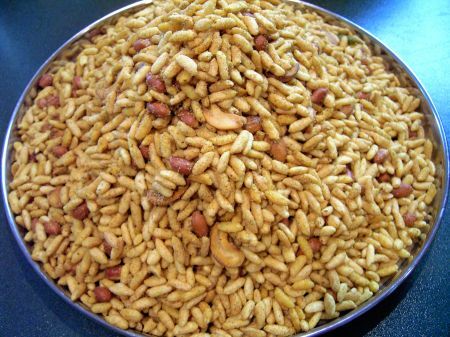 The most common items are Bhajnichi chakli, Bhadang, Chiwda, Shankarpali, Bhakarvadi, Ladoo, Shev. 1. In a bowl, mix oil with all the ingredients till coriander-cumin powder. 2. Add puffed rice and mix so the masala coats the puffed rice. 5. As the peanuts appear well roasted, switch off the gas. 6. Add puffed rice mixture. 1. The measurement of puffed rice is by weight. 2. According to â€œRuchiraâ€ by Mrs. Kamalabai Ogale, this bhadang goes by the name Bhadang from Sangli (â€œSangli che Bhadangâ€). I am from Mumbai. I am not familiar with the authentic taste of the bhadang from Sangli. So I do not know how close this recipe is to the original Sangli Bhadang but the only thing I can vouch for is its superb taste. The most common sweet flatbread is chana daal & jaggery stuffed PuranPoLi which also appears in several different states of India. Along with PuranPoLi there are Saanjori – where shira is stuffed in the flatbread and Saatori – where khoya/mava is stuffed in the flatbread. Some other delicious sweet flatbreads are telPoLi â€“ almost similar to puranpoli but rolled paper thin and uses more oil & gulPoLi – where jaggery and poppy seeds are used to make the flatbread. Shrikhand and Amrakhand are two most popular Maharshtrian sweets. 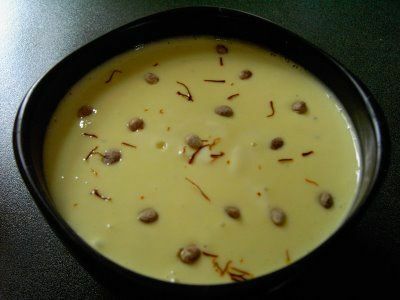 Shrikhand is generally made in many households on the Gudhi Padva day which marks the Maharashtrian New year. When you mix mango pulp with Shrikhand you get delectable Amrakhand – a must have during the summer which also marks the mango season. Steamed delicacies are Ukadiche Modak & Kharvas. Modak is considered Lord Ganesha’s favorite food and hence is made on the Ganesh Chaturthi day. Kharvas is a steamed pudding made from bovine colostrum milk. Several different types of kheers like shevyachi kheer, ravyachi kheer, dudhi chi kheer, gavhachi kheer, Tandalachi kheer, basundi are made. Tandalachi kheer (rice kheer) is generally made during Shraddha to pay respects to the dear departed. And hence is not made on any other festive occasions. Anarasay, Chirote, Gharge (pumpkin puris), Karanjya/Ghughra or kaanavle are deep fried delicacies which are generally prepared during Diwali time. Paakatalya purya is another deep fried sweet which is generally made when there is leftover sugar syrup from Gulabjamuns. Rava ladoo, Besan Ladoo, & Rava Besan Ladoo are the most popular ladoos made in Maharashtrian homes. Til ladoo is made for Makar Sankranti where as some other delicacies like Methi ladoo, Dinkache ladoo and ALeevache (flax seeds) Ladoo are made for the nursing mothers. Sakharbhat (sugar rice), NaraLibhat (sweet coconut rice), Keshar bhat (saffron rice) are three main sweet rices. They are generally made during NaraLiPournima or Rakshabandhan. The most ubiquitous sweet during the summer months is undoubtedly Aamras (ripe mango pulp). Kelyache Shikran used to be my momâ€™s fallback plan when we kids refused to eat the â€œboringâ€ bhaji. 2. Keep aside for 6 hours so the whey from the yogurt is drained. 3. The yogurt cheese obtained in the cloth is called â€œChakkaâ€. 4. It will be about 1 cup chakka. Mix sugar. Pass the mixture through a food mill to make sure that the sugar is nicely incorporated. 6. Take saffron in a spoon and keep on a flame for few seconds. Dissolve in warm milk. 8. Garnish with charoli nuts. 1. Adjust sugar per your taste. A while back, I read one statement about the diversity of India. It was said, that you can make one true statement about India. While that statement holds true, a completely opposite statement may also equally hold true. Please note that it is impossible to generalize anything about India or any of her states. There are always going to be exceptions. Each family, each home has their own unique way of preparing food and celebrating love. As the families fervently follow the old traditions, they embrace the new ones thus creating new traditions of their own which vary from home to home. This article was my humble attempt to celebrate the vast diversity and delicious food heritage of India. I thank Sailaja for giving me this opportunity. In both articles on Traditional Maharashtrian food, I have provided the recipe links from other food blogs for the readersâ€™ benefits as these recipes are not yet featured on my blog. Meera, thats a beautifully explained and well written article!! Very informative for a person like me who knows very little about Maharastrian food. Thanks Meera and Sailaja. The first time I explained the idea of ‘fasting foods’ to my firang wife, she almost died laughing. Great post. Meera, kudos to you for such wonderful articles on Maharashtrian cuisine. Your post was so well researched and presented, I especially liked the festival food section – hats off to your knowledge and willingness to share. Sailu thanks for these guest posts. Thats a very well explained post about Maharashtra cuisine Meera. Well done. It brought back so many memories. I loved bhadang when I was in Belgaum. What a unique taste it has. Thanks for writing such a detailed post. That was one lovely, informative post. Neat presentation. Wow nice to know about Maharastra cuisine. Recipes looks simple and gr8. Really this is the noblest service to ladies like me!!! I’m honestly saying Sailu, You are the main cause for my interest in cooking. Please keep it up. Thank you a lot. Thanks so much, friends, for your encouragement. Recipe of BHADANG is excellent! It’s a very rare recipe you get on the net! Many thanks to Meeraji! !